I don't have kids. But I imagine that if I did, dinner time would be chaotic. I don't know how you wonderful moms do it - to be honest. That time around six pm - or in some cases even eight pm - when you feel exhausted from a long day - not to mention a little hangry - always feels overwhelming. And then on top of that, the kids seem to feel exactly the same way! I've heard through the grape vine that maintaining a routine is key. That, and getting the kids to bed on time. I feel like things would get more challenging in the winter. The days are shorter, and it gets dark outside more quickly. And I feel like that might contribute to a more chaotic dinner routine - because we all feel like there aren't enough hours in the day as is. My team and I started brainstorming recipes that might be able to help - and we quickly came up with this delicious, wholesome and satisfying fried rice. It's also probably the easiest recipe I've ever shared on this blog. This recipe also happens to be of my favourite vegetarian dishes right now. You just throw everything into a frying pan and it turns out perfectly every time. The kidney beans replace the meat and provide ample protein. The red pepper is anti-inflammatory and ripe with anti-oxidants. And the rice helps satisfies the soul - especially on a cold winter night. It's filled to the brim with delicious spices as well. As we were preparing this recipe, we couldn't help but think this would make an excellent side dish for tacos - and it got my all excited. So that's definitely the recipe we'll be working on sharing next. You can throw in some corn, cilantro or even extra chilly flakes to make this dish more spicy. Start by cooking your rice - either in a rice cooker or on the stove top. 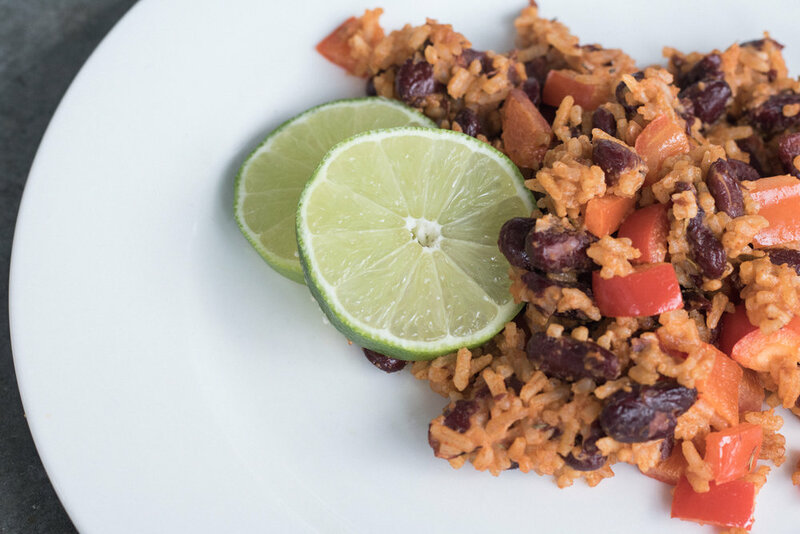 While I prefer to use brown rice, this recipe also tastes delicious with jasmine rice or basmati rice. Cut up your red peppers and set aside. In a large sauce pan, combine 1 large onion with olive oil until the onion is gently softened. throw in your garlic - finely chopped or pressed - and a pinch of salt + pepper to taste. Then combine your spices into the mix and stir until the onion is nicely covered. Follow by adding the red pepper and stir again. Fry the entire mixture on high for a few minutes, than lower the heat and let simmer. From there, drain one can of kidney beans into a colander and combine them to the mixture. Follow up with 1 cup of vegetable broth. Once your rice is fully cooked, transfer into your frying pan and combine it to the mixture as well. Simmer on low heat until favours completely mingle. From there, combine more vegetable broth until you reach your desired consistency. Transfer your rice to a plate, and top with fresh lime juice.